This much quoted poem by Emily Dickinson is one that causes an enormous amount of discussion in groups. Frequently people identify with it and describe feelings of insignificance, shyness, worthlessness and fear of being ‘seen’. More positive takes can include the pleasure in finding a kindred spirit – ‘there’s a pair of us’, the freedom of anonymity and a sense of getting one over on the ‘they’ who would banish us, if they knew. There are pleasures in being under the radar and sorrows in being ‘public’. An older woman in one group described the painful ostracism she experienced as a child because of being beautiful and talented and always being picked for the starring roles in school productions. I’ve recently found another level of engagement with the poem, living in a road where the blackbirds are kings of the roost and, this spring, have been telling their ‘name the livelong day’ in sweet, melodic song, from roof tops and trees, regardless of whether the bog is admiring or not. ‘Our deepest fear is not that we are inadequate. Our deepest fear is that we are powerful beyond measure. It is our light, not our darkness that most frightens us. We ask ourselves, ‘Who am I to be brilliant, gorgeous, talented, fabulous?’ Actually, who are you not to be? You are a child of God. Your playing small does not serve the world. There is nothing enlightened about shrinking so that other people won’t feel insecure around you. We are all meant to shine, as children do. We were born to make manifest the glory of God that is within us. It’s not just in some of us; it’s in everyone. And as we let our own light shine, we unconsciously give other people permission to do the same. This is quoted far and wide and I even read it myself at my Uncle Rags’ funeral – he was a larger-than-life former wartime pilot who was brilliant, gorgeous and talented and brought glamour and colour to everything he did. He had a loud laugh, sharp wit and wrote me fantastic letters when I was young and working abroad. He was also difficult, demanding and selfish. He adored his wife, my aunt, and had long affairs with two other women. He was immensely proud of his children but I don’t think he ever told them. He was probably closest to his cat, who travelled with them on family caravan holidays, and his pet rabbit and once spent weeks digging a trench and sinking a fence so that the rabbit could have the run of a paddock. I loved him very much. He came to mind when an old friend posted an article on narcissism on FB with a note that it might remind people of a mutual acquaintance. I asked who, but it’s not someone I knew. The article left me feeling a bit shaken. 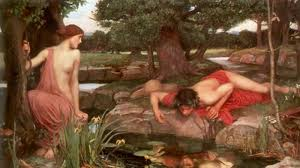 It describes ‘The Narcissist’ as a uniquely and categorically damaging and evil phenomenon, feeding on the admiration of others. I’ve been asking myself why I found the piece so disturbing and have come up with a few partial answers. The first is that I fear that there is a lot of narcissism in me – after all, here I am, telling my name to the admiring bog! I like pleasing others, doing a good job, making things happen, creating new things and of course, whilst I kid myself they benefit others, there’s a lot of self-serving there. Perhaps all writers are narcissistic, thinking that the world might be interested in their ideas. Like The Narcissist of the article, I fall short when it comes to love, over and over. I felt reprimanded by the article. The second, less personal (or narcissistic) reason is the unease I feel at categorizing people, especially by giving them labels. For The Narcissist, read The Jew or The Communist and the article takes on a sinister tone. I blogged previously on the proliferation of Personality Disorders in American psychiatry and how unhelpful it can be. There’s certainly bad behavior – lying to, manipulating, abusing or belittling others. And most bad behavior originates from fear – or in some cases sadistic pleasure – but it seems unhelpful to locate it ‘over there’ in The Narcissist when, as Solzhenitsyn observed ‘the line of good and evil runs through every human heart’. Identifying undesirable behavior as part of a personality syndrome somehow implies that ‘we’ – who are not The Narcissist – never engage in cruelty or unkindness. It also denies the real attraction of people who are larger than the rest of us. Yes, like my Uncle Rags, they are capable of bad behavior but they also bring a different kind of energy to the world and challenges to those they engage with. I suppose some people are their victims but I would rather see them as victims of abuse than of something called The Narcissist. For those of us who aren’t victims, a bit of light and warmth from a human star can be life-enhancing. A nuanced exploration of what it means to be a fan or an acolyte was explored in the film The Master, out last year, with Philip Seymour Hoffman in the title role with its endlessly slippery relationship between the ‘guru’ and his sidekick. Finally, I wonder about the shadow side of the writer of this article who is so invested in describing – or even inventing – the character of The Narcissist. What is behind this interest that extends as far as writing a book about it? ‘The bigger the front, the bigger the back’. Thanks so much for this comment Mary, I will look up The Ice Man and also ‘mirror genes’ (which I hadn’t heard of). I still feel more comfortable with seeing personality traits as on various continua rather than reflecting categories of people. And I think a dynamic between two, or more, people is a function of all of the many characteristics (and personal histories) of all of them. Am fascinated that Sam Vaknin is a self-confessed narcissist – I wonder why he was compelled to write about ‘The Narcissist’ as opposed to a first person account of his life – feels like an interesting hall of mirrors. Will check out the book when my to-read pile has shrunk a bit! It’s the documentary of the IceMan not the movie. Sam has written about his own background – he’s very prolific online! Good engaging with you again!